There are some special places at DCC which outdoor education guests should see. They are listed here for your reference. Ask camp staff for assistance in finding them. 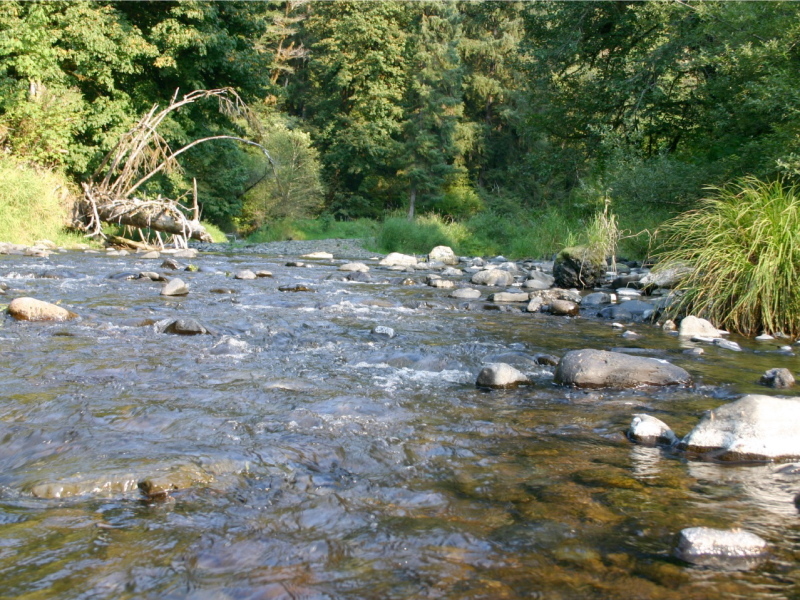 Drift Creek camp is surrounded by a beautiful coastal stream which is a popular site for a variety of outdoor education activities including collecting and indentifying macroinvertebrates, water quality and stream flow research, and searching for and casting bird and mammal tracks. Some groups have experienced the loop in inner-tubes, kayaks and small canoes. 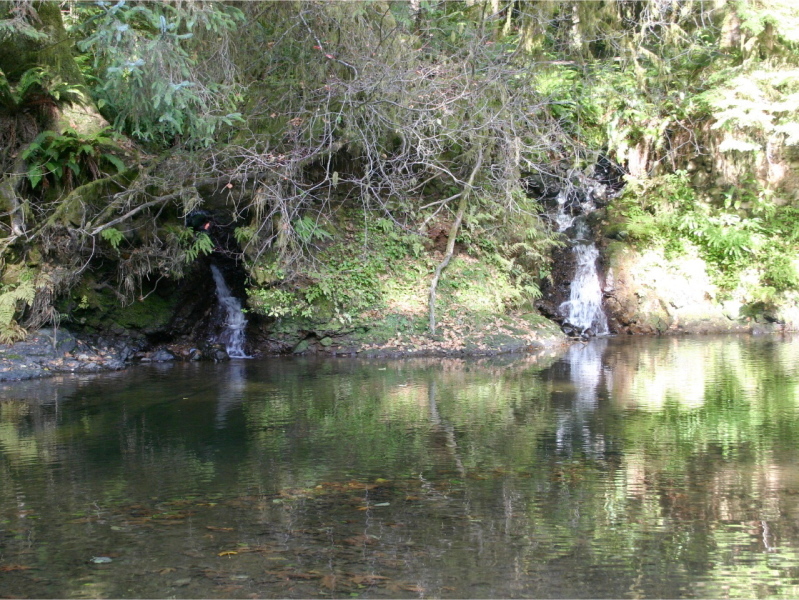 The Narrows affords the opportunity to view Drift Creek as it enters (on the left) and leaves (on the right) ‘The Loop’ that defines the boundary of DCC. In addition to some spectacular views of the creek you will find numerous ‘nurse logs,’ specimans of all the coniferous trees in the area and many other native plants. 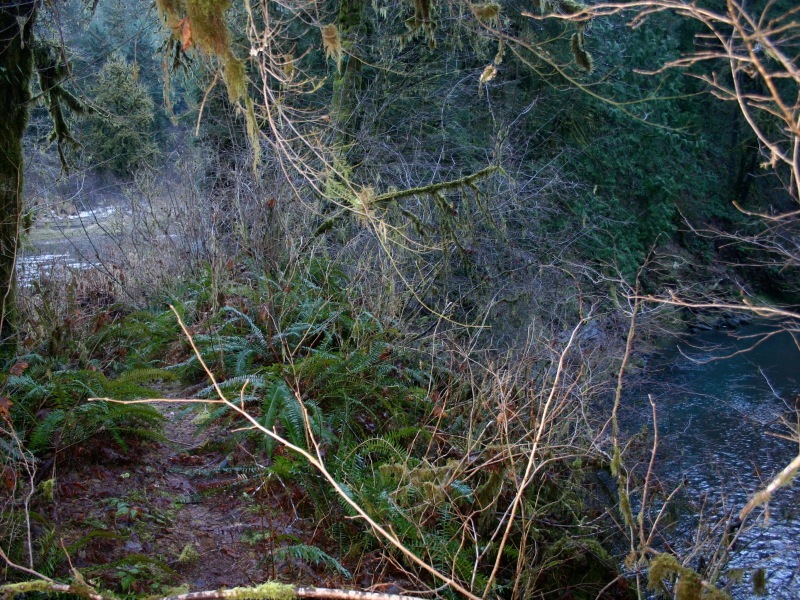 Closer observation will reveal mushrooms, mosses and lichens plentiful in the area. The source of these Twin Falls served as the water source for DCC for over 40 years and is a potential source for a micro hydro generator. It is an especially picturesque and secluded spot on the northernmost point in the loop. Take your camera and plan for some ‘quiet time’ when visiting this spot. DCC has an abundance of Nurse Logs, which are an indicator of ‘late succession forests.’ This particular specimen is on the south side of the playground and the starting point for many outdoor education activities. When hiking the trails of DCC, students should watch for more nurse logs and may wish to make a digital photo collection of the specimens they encounter. 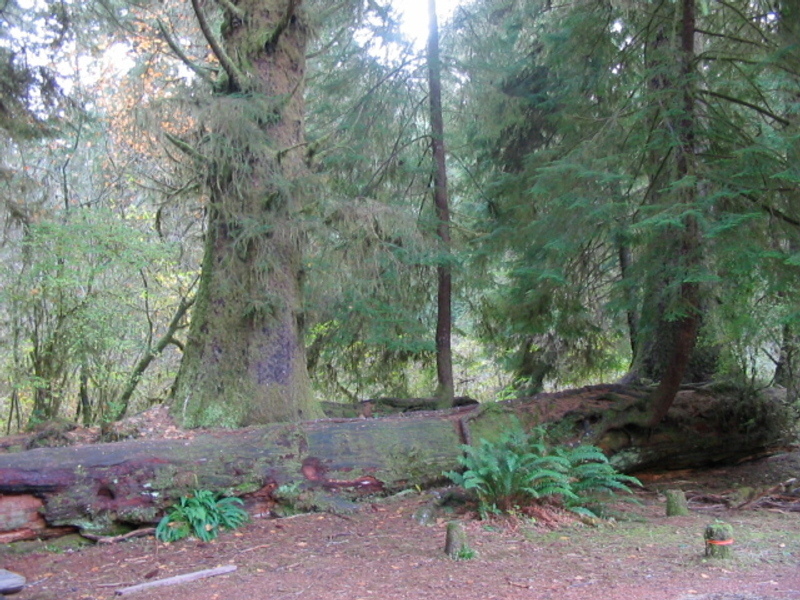 Hiking the trails of DCC, you will find numerous examples of Stilt Trees which sprouted and grew on a nurse log or stump. 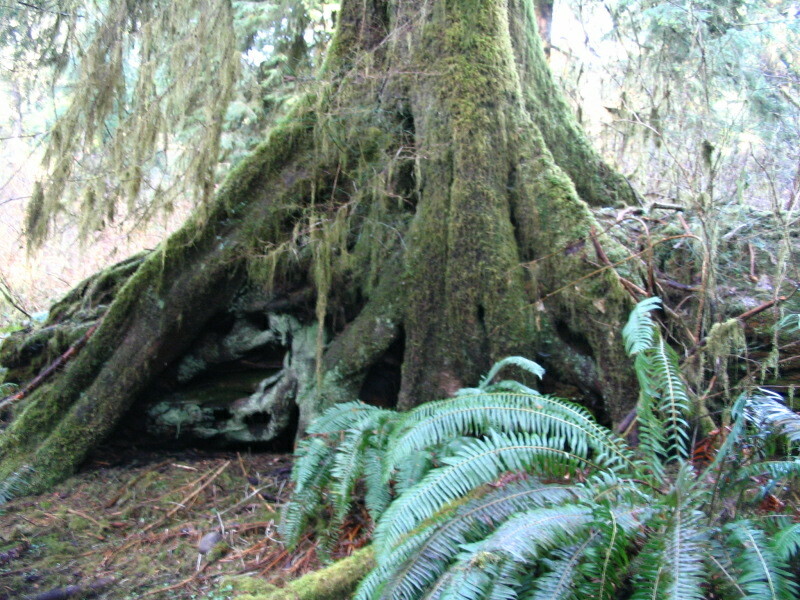 When the nurse log decomposes, it leaves the apperance of a tree growing on stilts. See how many variations you can find. 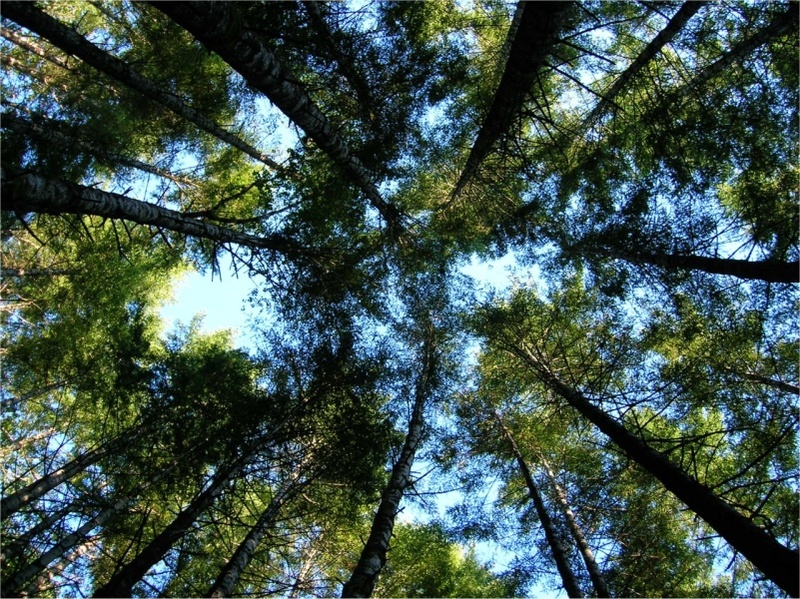 The Forest Canopy of the temperate rain forest is a diverse and complex ecosystem. Take time to observe this diversity on your excursions through the forest. You may enjoy visiting The Temperate Rain Forest Canopy of the Pacific Northwest website before or after your visit to DCC. Check out the activities for students and the resources fot teachers. 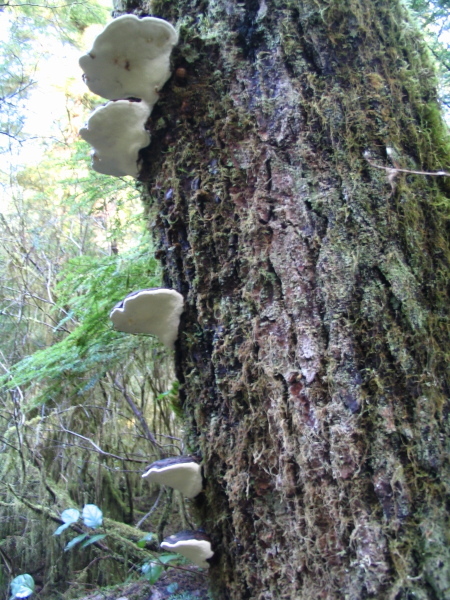 The Artist’s Conk is a common year-round fungus found on the dead wood snags of the Temperate Rain Forest.. You will find them in abundance on the Inspiration Point Trail. You can learn all about them at this website. 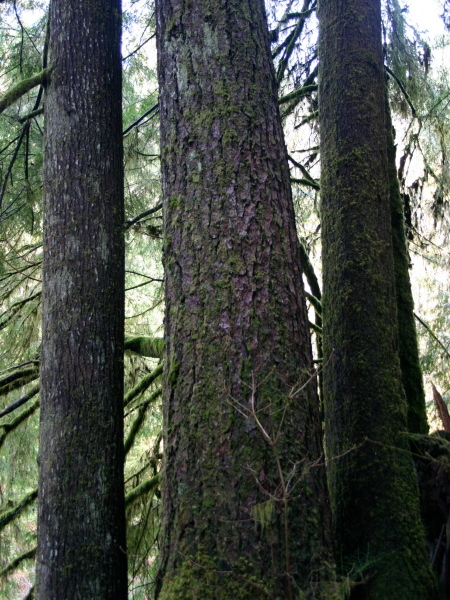 Along the Creekside Trail is a cluster of Three Species of mature conifers including a Douglas Fir, Sitka, Spruce and Western Hemlock of similar size and age. This is a good place to compare and contrast the bark, needles, cones and growth habit of these species. 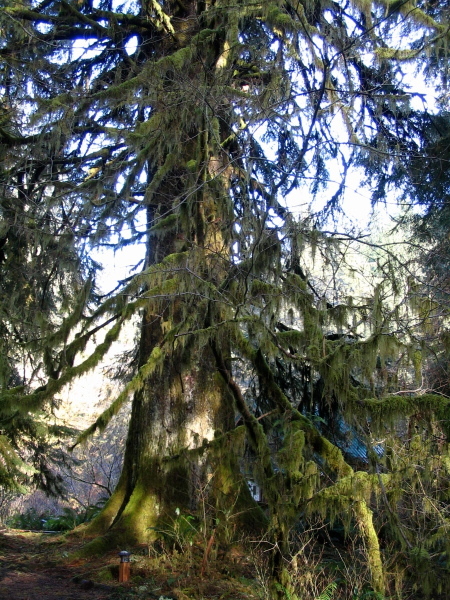 You can learn more about these and other trees native to the Temperate Rain Forest at this website. 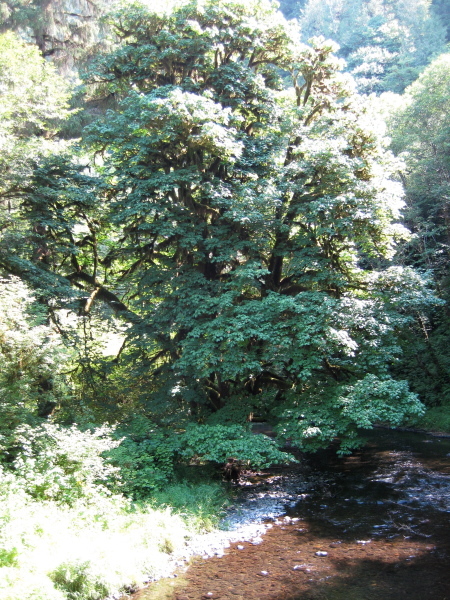 The Big Leaf Maple is another tree native to the Temperate Rain Forest. You will find a n especially nice speciman just to your right as you cross the DCC bridge upon your arrival to camp. If you miss it on the way in, it is well worth the walk back to see it.